Eighteen weeks later and the group is still playing after nearly 33 hours in total! Game play went smoothly again, considering I have recently had hardware problems with one of my computers (the one my wife's character is stored on). After being switched on, it now wants to reboot a couple of times before settling down, which suggests to me that I have a heat-related problem and may turn out to be the same as it was before when the memory needed reseating. Anyway, that aside, the game went smoothly apart from one small hiccough when Myara's hitpoints suddenly appeared to drop a significant chunk for no apparent reason. I was unable to give any explanation for this, but a simple reload of a slightly earlier position restored her to the correct amount. Reloading like this is not something I usually recommend with Soul Shaker, due to its use of campaign variables, but if you know what you are doing and needs must, then it can be done. Doing so, did mean I had to live edit the database so that we could all use the latest Soul Orb Prison again, but it was easily done. As an aside, I decided to look for fellow NWN bloggers yesterday, and in particular, NWN2 bloggers to see how other are getting along with their projects. After a couple of hours surfing, I found a great bunch of sites that appear to have regular correspondence between each other and have added all of them to my own blog selections. It was good to see many names that I already recognised there as well, and hopefully, I might be able to start getting a little more interactive with them all myself. After all, I know what it's like trying to build a module ... it's always nice to get feedback and encouragement from fellow builders. "The group found at least six tomes: One read as a Project Diary, another as a book on Denizens, and the final four made a set of volumes that spoke about the planes of existence, entitled, Myria Planus. 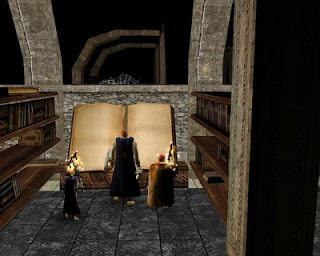 Each of these larger tomes gave a great deal of insight about the Realm in which they now found themselves, and the Project Diary even revealed one or two plans of the lich and how it hoped to accomplish them. Whether it spoke in truth or madness, it was hard to tell. " Read the full synopsis here.